As the weather gets warm and the days get clear, you're going to want to relax and enjoy the outdoors. 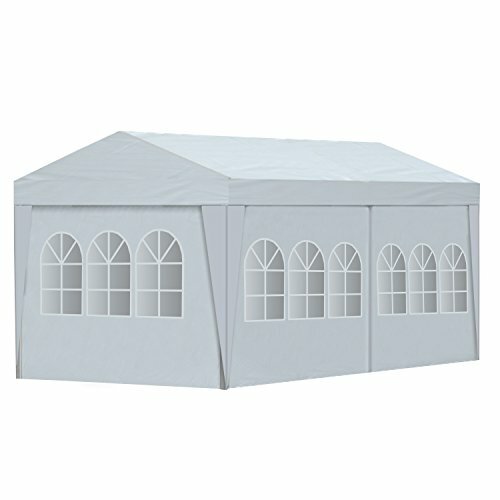 This year, make sure your barbecues and outdoor events are the best yet with ALEKO's party tent! High quality, powder coated and corrosion resistant steel frame will last a long time in inclement weather, and the roof is made of weather and water resistant polyethylene, so you can spend less time cleaning and repairing and more time relaxing and entertaining! ALEKO's party tents are a snap to assemble, and come with all the required fittings and support poles, so you can be sure that your tent will remain stable no matter what! Make the most of the warm weather with ALEKO's party tents, and get ready for a season of fun! Package includes (1) top cover, (4) side walls, (45) metal poles and all fittings. Product dimensions: 20 x 10 x 8.5 feet; Color: White.